(Newser) – The point of a CV—or resume, in more American parlance—is to highlight all of your finest awards and accomplishments, right? 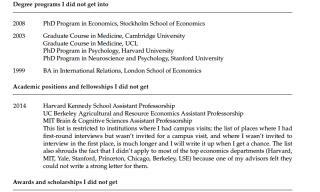 Johannes Haushofer takes a different approach: Although the Princeton psychology professor has a standard resume he sends out, he's also compiled something a bit more unusual, per Quartz: a "CV of Failures." "Most of what I try fails, but these failures are often invisible, while the successes are visible," he writes at the top of his documentation of defeats, which he tells the Washington Post he started compiling in 2011 as a show of support for a friend having some bad luck professionally. The intro to the CV notes that when people see others' string of successes, "they are more likely to attribute their own failures to themselves," while in truth, "the world is stochastic, applications are crapshoots, and selection committees and referees have bad days." I always thought FAILURE was not an OPTION in the REAL WORLD! But things do change! As in the recent NEWSER story for a CEO FAILURE-4/30/16 Yahoo's Marissa Mayer Could Get $55M GOLDEN Parachute!! WOW! Caused she failed to stop Yahoo's downward spiral during more than three years with the company!! Now that's a REAL FAILURE & still get REWARDED! What a Society we live in today's World! PAYING FOR FAILURE! There ya go ALL!! He probably lied about some of his failures. It's a resume, its a fair assumption.